In part one of this two-part series, we took a little ride through the first half of The Beatles White Album and dug up some fun facts for the initial 17 tracks. As promised, let's carry on now with the second half of the double album! The entire song was written in the studio one September evening while Paul was waiting for the others to show up for a White Album recording session. By the end of the evening, the song was fully recorded. A cool trick, to be sure, but there's a flip side to banging out something that quickly: John famously said of the tune, "it was a piece of garbage." This track was recorded during the same session that saw Paul record "Wild Honey Pie," and as on that track, so also here Paul handled all of the vocals and instruments himself (not including the brass, of course). Fact: this track is not very good, until you crank up the volume to nose-bleed levels, at which point it becomes awesome. George Harrison wisely talked John out of being quite so on-the-nose about the whole thing. The mono version of this recording does not contain Ringo's cry at the end of the song, "I've got blisters on my fingers!" On the final, drawn-out chord of this song, the recording features a rattling sound that was quite deliberate. A bottle of Blue Nun wine sitting on top of a speaker was the culprit, but The Beatles liked the odd little addition so much that they had their assistant producer put microphones around the bottle so they could capture the sound more fully. At the end of each chorus there is a short acoustic guitar riff that is introduced by two loud, crashing drum and cymbal hits, such as the one found at 1:17 on the track. However, at 3:24 this drum crash is heard *three* times instead of two, adding an extra beat to the measure. This was an accident in the editing room. At this point in the song, a different take was spliced in, but it was added one beat too late. This track is just one of a very small handful of Beatles songs on which John -- not George or Paul -- played the lead guitar solo. (Other examples include "Get Back," "You Can't Do That," and "Hey Bulldog.") As George Harrison later said, it was "a brilliant solo ... sounded like Django Reinhardt or something." The haunting "can you take me back?" outro of this song was a bit of spontaneous nonsense recorded by Paul between takes of "I Will." The snippet heard here only lasts a few seconds, but the extended recording (which can still be found on YouTube) goes on for almost two minutes, and includes Paul singing lines like, "I ain't happy here, my honey, can you take me back?" The name "Revolution 9" suggests some link to the earlier track "Revolution 1," and indeed, there is. While recording Take 20 of "Revolution 1" (which begins with Geoff Emerick announcing "this is Revolution, take ...", followed by John's interjection, "take your knickers off! "), The Beatles went into an extended ten-minute jam. This jam, featuring John screaming "all right! 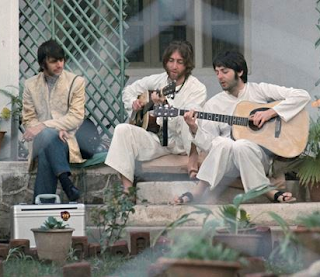 ", is what was later used as the base for "Revolution 9." Tape loops and effects were added later, and we're all richer for it, I'm sure. Rubber Soul: "Run For Your Life"
Sgt Pepper: "A Day In The Life"
Magical Mystery Tour: "All You Need is Love"
The White Album: "Good Night"
A version of this song featuring John's original piano accompaniment can be heard on the Anthology 3 album.